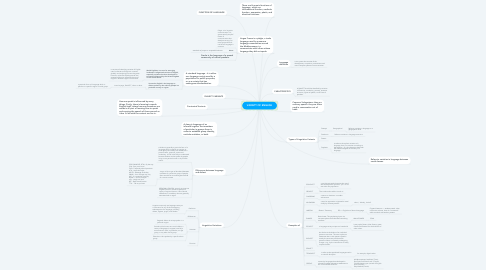 THIS MIND MAP IS ABOUT THE VARIETY THAT EXISTS IN THE ENGLISH LANGUAGE. VARIATION IN SPEECH BY ERIKA G. VARIATION IN SPEECH BY ERIKA G.
1. Refers to variation in language between social classes. 2. How we speak is influenced by many things. Firstly, there is learning to speak English itself, where how we pronounce our words is all part of learning how to speak and copying the speech of those around us. it has to do with the context we live in. 3.1. It is a system that consists of the development, acquisition, maintenance and use of complex systems of communication. 5. There are five main functions of language, which are informational function, aesthetic function, expressive, phatic, and directive functions. 6. Lingua Franca is a pidgin, a trade language used by numerous language communities around the Mediterranean, to communicate with others whose language they did not speak. 6.1. Pidgin: it´s a linguistic communication. It´s grammatically simplief means of communication that develpos among 2 or more gropus that do not have a language in common. 6.3. Creole is the language of a speech community of native speakers. 7. A standard language : it is either as a language variety used by a population for public purposes, or as a variety that has undergone standardization. 7.1. World Englishes is a term for emerging localized or indigenized varieties of English, especially varieties that have developed in territories influenced by the United Kingdom or the United States. 7.1.1. It consists of identifying varieties of English used in diverse sociolinguistic contexts globally and analyzing how sociolinguistic histories, multicultural backgrounds and contexts of function influence the use of English in different regions of the world. 7.2. Vernacular English is the language or dialect spoken by the ordinary people in a particular country or region. 7.2.1. It can be jargn, DIALECT, idiom or other. 7.2.1.1. a particular form of a language which is peculiar to a specific region or social group. 9.1. A DIALECT should be identified by variation of Grammar, vocabulary, prosody, sentence structure, figures of speech, social class of speakers. 11. A slang is language of an informal register that members of particular in-groups favor in order to establish group identity, exclude outsiders, or both. 12.1. A dialect is generally a particular form of a language which is specific to a region or social group and usually has differences in pronunciation, grammar, syntax and vocabulary. It's still a bit fuzzy to understand because dialects can be spoken by people living in one particular town or by a whole nation. 12.3. REGIONAL LEXICON: not only in American English but also in British English has a variety of regional lexicon. Lists of lexical differences in vocabulary that are generally associated with a region. 13. Common Vulagarisms: they are ordinary speech. they are often used in conversation out of habit. 14.1.1. Linguists commonly use language variety as a cover term for any of the overlapping subcategories of a language, including dialect, register, jargon, and idiolect. 14.3.1. Regional dialect: A variety spoken in a particular region. 14.3.2. Sociolect: Also known as a social dialect, a variety of language (or register) used by a socioeconomic class, a profession, an age group, or any other social group. 14.3.3. Ethnolect: A lect spoken by a specific ethnic group. 15.1.1.1. Refers to variation in language on a geographical level. 15.2.1. Refers to variation in language over time. 15.4.1. It refers to the stylistic variation of a language, that is its variation according to the situation. So, this dimension deals with the different degrees of formality of a language. 16.1.1. a sociolinguist would examine the use of the second person pronoun "you" for its use within the population. 16.5.1.1.1. Flipped classroom — students watch video instruction at home, then do “homework” while at school with teacher present. 16.7.1.1. have purple flowers, blue flowers, green flowers and flowers of a whole bunch of other colors. 16.8.1. An idiolect is the dialect of an individual person at one time. This term implies an awareness that no two persons speak in exactly the same way and that each person's dialect is constantly undergoing change—e.g., by the introduction of newly acquired words. 16.10.1. It refers to the specialised language used in a scientific discipline.